Optimists are always looking for a ‘silver lining’ in anything that seems negative. Of late, the world has erupted into riots over various issues and several governments have been toppled while several others remain vulnerable. The reasons for the rioting has varied from desire for freedom, desire for democracy, irresponsive governments, and living standards that are declining due to inflation. In somewhat of a case of manifest destiny, Libya has been witness to riots that have threatened their oil production which has pushed oil prices higher which pushes inflation higher. Yes, I know the Federal Reserve claims there is no inflation but we are talking reality right now. The fire of revolution was lit on September 1, 2010 when the Fed Chairman Bernanke announced a QE2 program to buy a trillion dollars worth of Treasury notes and garbage mortgage paper from shill banks in the US. Of course this action is inflationary and the world was already struggling with price hikes due to all the other previous central bank manipulation, infusion, and confiscation of wealth. Let the record show that all this effort on the part of the Fed and the ECB was to save the big banks of the US and Europe by robbing the citizens’ Treasuries and giving the loot to bankster Presidents. Exhibit ‘A’ is over the past few weeks several big banks announced multi-million dollar bonuses to their CEOs. Well, good for them. However, the rest of the world didn’t get a million dollar bonus and they find it harder and harder to put food on the table each week. Given that governments are on the side of the banksters, the citizens of the world have taken to revolt. And yes, there is a silver lining. Of course the main goal of the Fed is to enrich the banksters by any means necessary and at any cost. And, since the top 90% of income earners own 90% of stocks, pumping money into banks in turn pumps money into the stock market. Hurrah! The stock market responded from September on by rallying strongly. That is certainly a silver lining to the wealthy while the rest of the world starves and the banksters gorge themselves on the booty of central bank wealth confiscation. The other silver lining is silver. The chart below is the silver ETF, SLV over the past six months. Like the stock indices owned by the central banks, silver has also been in a bull rally. It is interesting that at about the same time each month, a day in the first week of the month witnessed heavy selling (circled in blue). The trend remains bullish but the timing smacks of attempted price manipulation. Maybe I’m just paranoid but markets are seldom so well timed. But February was different. The selling of silver didn’t happen at the beginning of the month but at the end. Did someone forget to try and manipulate the market? Coincidentally, precious metals rise when there is strife in the world. Egyptian riots began to boost silver at the end of January and maybe the manipulators of the world were just busy trying to guard their vaults. Then Libya broke out in revolution and silver just kept on rising. So now we have inflation, rising oil prices, currency trepidation, and political strife throughout the Middle East and other parts of the world. Add all that together with a Federal Reserve determined to destroy the US dollar and silver looks like it could keep on rising to the sky! Rarely do we enjoy a clear message from the Dow Jones Industrial Average. Or rather, rarely do we enjoy a clear message from the powers that govern the Dow Jones Industrial Average. But since September 1, 2010, we have been given a very clear message. That message is, ‘don’t sell’. The key event driving this message was the Fed’s meeting in Jackson Hole, Wyoming at the end of August, 2010. Bernanke emerged from the meeting with a trillion dollars in QE2 money and an unwavering determination to float all boats with whatever amount of money was necessary. The trick is that the act of buying Treasuries and mortgage paper from the banks actually pumps money into the banking system and that money gets expanded by a factor of ten. The result is from September of 2010 to June of 2011, the banking system will pump $10 trillion dollars into the economy. Or, more specifically, the stock market. The past week someone said to me, “I don’t know what’s driving up the market but I know it’s going up.” My response was that I knew very well what was driving the indices higher. The Zimbabwe experiment was a proven success. The stock market does not need an economy nor employment nor capitalism. Don’t concern yourself with any of the data or reality. It just needs money. The more money it has, the higher it goes. In truth, the Federal Reserve can’t do much to fix a broken economy. All it can do is flood the system with money and credit. All stock markets are the same in that respect. For instance, China is presently trying to slow the expansion of money by raising interest rates and reigning in credit. Their stock market has responded with a negative reaction. 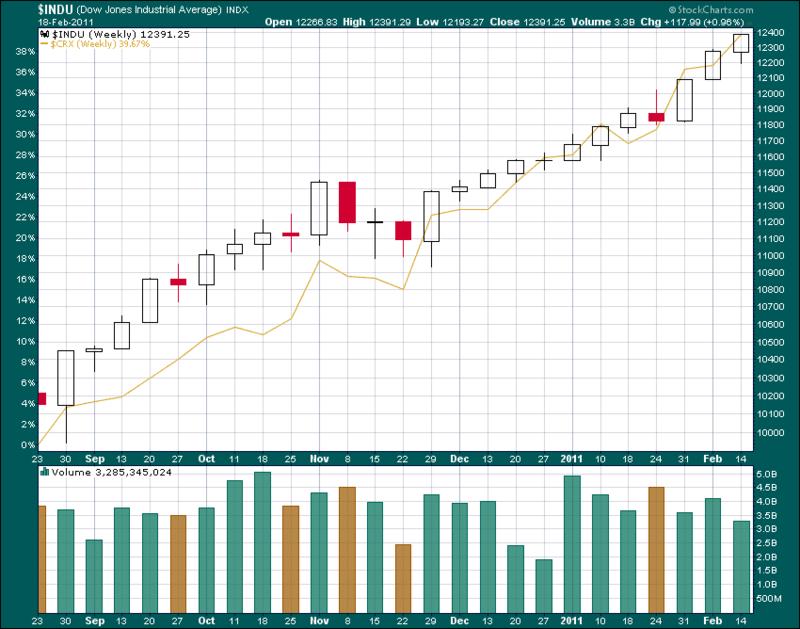 The US indices have responded to Bernanke’s call to rally with a decidedly positive push higher. It’s not rocket science. The strategy is simple. The Fed will simply flood the markets with money and the populous will feel richer due to market gains. However, the top 10% of income earners own 90% of the stocks. The effect has been to further expand the gap between the rich and the poor. But it is important to remember this key point. The central bank is not, and never has been, a tool of the poor. The central bank was implanted into the core of the economic system to expand the riches of the rich. It will not fail them no matter the cost. The cost is of course enormous. The world is witnessing a confiscation and concentration of wealth as a prize to the central banker shill banks. Their leaders are enjoying banner bonuses into the millions while the numbers of the poor are growing and their existence is suffering. Thus, we are also witnessing riots throughout the world as the effects of bankster enrichment drive the populous to the streets in protest. The populous may not as yet fully understand who put the bridle into their mouths. But they do notice when the oat bag tied around their ears is not as full as it used to be. Here is where investors have to keep their minds focused. The poor people of the world have to get trampled for the good of the bankster bonus. In the US for example, trillions of dollars have been confiscated from the citizenry and their Treasury by various actions of governmental interference as directed by the central bank. The money has been used to enrich the banker elite. The same has happened throughout Europe and the rest of the world and the effect has been two-fold. One, the stock indices of the money and credit expanders have risen nicely. And two, money expansion in any form leads to inflation. Inflation drives up prices for everyone but especially for those who can least afford it - the people that don’t own stocks. When the price of gasoline and food begins to impair already impaired living standards, people become prone to rioting. The chart below shows the relationship between the Dow and the commodities ETF, the CRX. This is no big secret and again, it’s not rocket science. 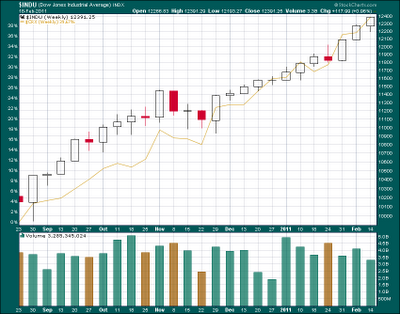 The Dow is in candlestick and the CRX is in gold. Beginning in September of last year, we can see that commodities have spiked right along with the Dow. Most of us already know this from going to the grocery store or filling our car up with gas. But every time we pay for something that costs much more than it did the previous week, we should console ourselves with one very important realization. That is, at least the CEOs of JP Morgan and BofA got nice fat bonuses. Yes, it was at our expense but we are all idiots by allowing for such through ignorance, apathy, and cowardice. Or maybe, we just can’t find enough rocks to throw. It’s all good as long as the Dow goes up, right? Tell that to the people rioting throughout the world. If we think the world hates America, just wait until they figure out that the higher prices they are paying are because our bankster CEOs are recouping all their derivative losses. Oh, there’s that word again - derivatives. Let me just give a shout out to the Chief of Bahrain (the latest country to be embroiled in citizenry rioting). I just checked on the credit default swaps tied to your country’s debt, and they are getting more expensive by the day. Sure, no one cares if you abuse your citizens. You can impoverish them, steal from them, and beat them down. But listen, fellow. When the credit default swaps rise and imperil the banksters that deal in derivatives, you have got to go. I’d advise you to leave early next week. It’s over. 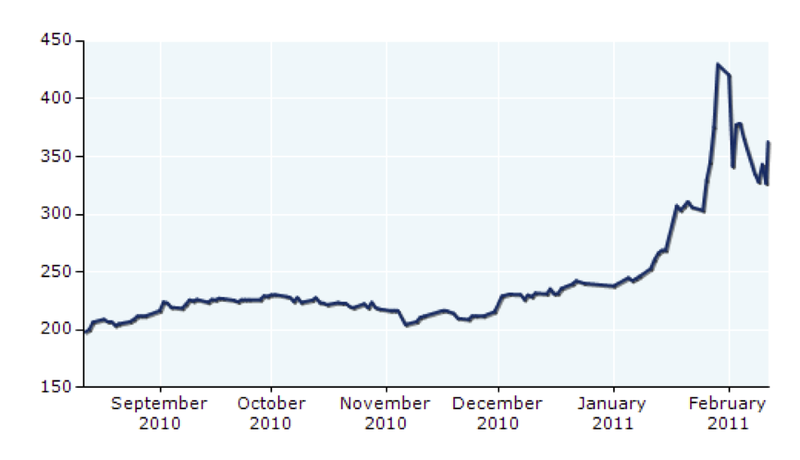 So, for us investors, we just need to look at the chart and read the clear message of Ben Bernanke. The Dow will go up and the Fed will make sure it does. Of course, commodities will rise with the Dow. Prices will keep rising so that eventually the rioters will have to go home on account of not being able to afford to buy any more rocks to throw. Besides, aren’t the banksters safeguarded with shatter-proof glass windows? A final word about the chart. Since the Fed’s announcement of QE2, there have been only 5 negative weeks on the Dow. The worst of which followed the mid-term elections in the US. Could the message get any clearer? Yes, we all know what has been happening in Egypt over the past couple of weeks. Well, maybe most Americans don’t. The TV show ‘American Idol’ is back in season and some nitwit on some other reality show is thinking about changing her eye shadow or something. But for the rest of the world, we are witness to a profound change in the politics of Egypt and that change was brought about by determined and massive citizen dissent. The people of Egypt were fed up with a lying, corrupt, oppressive governmental regime that had stolen the riches of the country only to deposit them in the hands of a minority elite while all the time promising reform and change. They were not only fed up the US, they were also fed up with their own regime. They were tired of their government regulating the citizens to death. They were tired of their government waterboarding the citizens with no regard for civility or law. So they did what they had to do. They revolted against the regime in charge. Maybe it’s my Scots-Irish blood but I just love a good revolution. The yearning of freedom from oppressive governmental regulation should resonate within the soul of every human being. The people of Egypt deserve to be free and they shouldn’t have to be dominated by government of any kind. The genius of Thomas Jefferson and James Madison framed the US government as it should be - a servant of the people and not the other way around. But ever since the Constitution of the United States became law, the central bankers have been trying to erode and dilute the document’s containment of government power. It is only through government power and concentration of that power that a central bank can exercise its influence. That influence once rooted, grows unfettered until it is empowered through regulatory dominance. Occasionally, there is a populace uprising like we see in Egypt. May God be with the people seeking freedom! Why do I bring central bankers into the picture? Because they are into everything and they seek power by any means necessary and by any action necessary. We mustn’t attach too much to any revolution in context to today’s environment. The crux of any political change does not lie in whether or not the populous is enslaved or oppressed. Political change does not lie in whether or not the populous is starving due to the inflationary tactics of central bankers. Political change doesn’t even lie in whether or not certain nations seek to militarily dominate their neighbors. No - we can, and do, live with all that. In fact, most of us turn a blind eye toward governmental abuse as long as our favorite stock index keeps rising. Central banks have been flooding the system with money and credit and ultra-low interest rates to sustain this stock ascent. Central banks and markets now work in concert. Of course, all of their activity is focused on dominance and centralized wealth. Centralized wealth allows for monopolized lending. The central banks control that lending. They, and their shill banks, insure that lending through derivatives and credit default swaps. Now, for a moment of truth. The central bankers can tolerate revolution. They can even tolerate regime changes. But, when this activity begins to disturb the valuations of their credit default swaps, now we are talking about a call to action. Bankers now stand to lose money! Shown below is a chart of the credit default swap values for Egypt over the past six months. 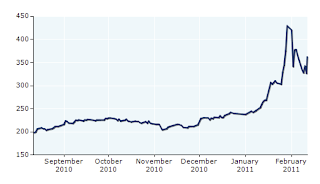 This is a graph of how much it costs to insure the credit default swaps tied to Egypt’s debt. As you can see, when the revolution erupted a few weeks ago, so to did the cost of the CDS’s. As the CDS cost threatened to rise further, something had to change. Either Mubarak had to resign or the bank would have to call in the military to do what the military does with all the weapons that the US provided. This is how I knew Mubarak would go. Military action would have escalated the CDS costs. Now Egypt will have to make a transformation in leadership. The CDS chart will be interesting to watch. Should Egypt decide to follow the US model and surrender to the banks, the CDS costs will likely fall immediately. Then, they will likely escalate like Ireland’s or Greece’s have as perpetual sovereign debt is established. Egypt will then be bound with the enslaving ropes of TARP or TALF or QE or POMO. They will have surrendered like the US did in 2007. Should they elect to follow Jefferson and Madison and Jackson and shun the central bank dominance, the CDS costs will rise in the interim and then fall to zero and perhaps even disappear. Then the central bank will have to make another decision. Look at Chart 1 and it is easy to see why Mubarak had to leave office. Given the potential market reaction to Mubarak resigning as President of Egypt, one wonders if anyone could have anticipated such an action. One only has to look at the DIA ETF from February 10 - the day before Mubarak’s resignation. The following chart is a 5-minute bar intraday chart. We can see what I call the ‘POMO’ pattern at work. The indexes sagged at the beginning of trading only to be goosed in fairly heavy volume by a ‘force’ that didn’t want the index to fall further. From mid-morning, the index traded flat with light volume. 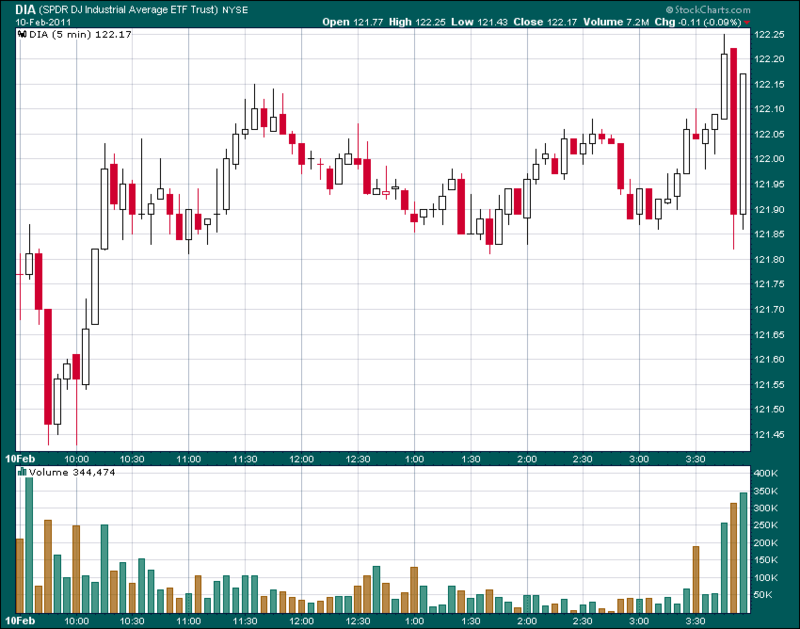 Then, in true Federal Reserve fashion, the final fifteen minutes of the day exploded in trading volume and volatility. At 3:45, the DIA burst higher. At 3:50, a strong selling program hit that accounted for some 5% of the entire day’s trading volume over 5 minutes. However, at 3:55 (the NYSE closes at 4:00), someone was ready with more than 5% of the day’s trading volume in the final 5 minutes of the day to jack the DIA back up. Whew!! Did somebody know something was about to happen in Egypt? Or, was someone just determined to carry on with the stock index rally? Let’s just call that someone, ‘the central bank’. Look at Chart 2. Now, what should investors do? The problem of Egypt’s CDS’s was solved on a Friday with President Mubarak’s resignation. The Fed has the pedal to the floor on the stock rally. Unemployment in the US has dropped to only 9% and supposedly, the US is the only nation in the solar system that does not have any inflation. Well, of course not. What would one expect in a controlled, contrived, dominated, and oppressed society? What would we expect from our stock indices? Onward and upward my friends!! Oh, and a word for world leaders. You can do to your citizens whatever you please. Chain them, whip them, starve them, steal from them - we don’t care. But, if do something to mess with the credit default swap values - you gotta go!! The big story in the world right now is the riotous nature of citizens in a succession of countries. The latest riots are in Egypt and its citizens are calling for the government to step down. The simple truth is the lie has gotten old and citizens are rebelling. Citizens are tired of government oppression and they are tired of the erosion of their living standards. They may not know the root cause but citizens are getting fed up with governments that don’t work for, nor represent, the people. Amen, brothers and sisters. Allow me to inject some clarification and reflect on how stock investors should view the riotous turmoil. Modern governments have come under the spell of banker elites. Governments have turned their backs on their citizens to exclusively support their banker puppet masters. The riots should not be unexpected. Actually, we should all wonder what took people so long to get mad. Facing hunger and limited prospects of remedy, the people are finally on the march. The anger is born not because there is a food shortage. Indeed not. The anger is born from rapidly rising food prices and that is the effect of inflation. The inflation is the result of the central banks of the world riding to the rescue of broke bankers who bankrupted themselves with derivatives. Governments everywhere have a misguided notion that a relative few banks faced with a sudden realization of negative capital could imperil the government regimes. They reacted by stealing money from the citizens to give it to the banks. They did so through printing, taxation, and legislation. None of these actions serve the citizens nor represent the wishes or best interest of the citizens. Naturally inflation rises from the saving of the big banks and the first real wave has hit food prices. I suspect most people rioting are not aware of the root problem. They are hungry and don’t see their governments as a source of remedy. Worse, they understand that their governments are in fact part of the problem. Specifically, their governments can no longer tell the truth about anything. Governments have been so audacious and arrogant to try and lie their way to economic recovery. Brothers and sisters in revolution, please allow me to inject the truth. The point of government is to enrich the banks by any means necessary. The two biggest economies in the world, the US and the European Union, kicked things off by plunging into debt at the urging of the banks since the banks were perfectly hedged with derivatives. Turns out that when the debts couldn’t be repaid, the derivatives were worthless. Down went the big banks and in came the government. The banks were restored with the treasures of the citizens. The best way to steal money is through inflation and the best way to instigate inflation is through the proliferation of money. The money of course was given to the banks. The debt to produce that money was given to the citizenry. The result is crushing inflation. Now we know the lone goal of the government - to support the banks. Sure, inflation is driving up the price of food and energy. But rest assured my friends. The CEOs of BofA and JP Morgan have received their multi-million dollar bonuses. Yes, other lending institutions throughout the world have rewarded their CEOs who ran their companies into the ground with millions in bonuses. The Wall Street crowd has enjoyed one of their best years ever in 2010. They had to be restored. We couldn’t possibly let Goldman Sachs go broke, could we? AIG? BofA? 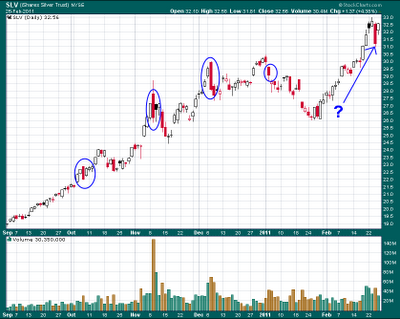 Citigroup? And on and on we go. So, brothers and sisters, revolt as you wish. But until you know the source of your economic destruction, you are blindly wielding a protest. Sure, the government leaders are loyal only to bankers and care nothing of its citizens. Yes, they probably need to be changed. But remember this - democracy is an illusion. The US claims to be a democracy (in actuality it is a republic) but the majority of citizens didn’t want a health care tax increase. But they got one anyway. The majority of its citizens object to airport molestation. But they get it anyway. The elected leaders do not represent their electors. The arrogance of government is that it can act as it likes and answer to only the banks. Government tries to placate the populous with lies about everything. For instance, the US just released the unemployment number and it fell to 9%. No one with a functioning brain cell believes that but the idea is the economy is in recovery. It better be. Food prices and gas prices are rising by the day. And yes, the US claims to have hardly any inflation. Government oppression is necessary to redistribute wealth from the citizens to the government. Lies are necessary to facilitate the transfer. The riots in Egypt can be traced to what is happening in the US. For instance, one of the wealthiest communities in the US is now concentrated around the capital in Washington, DC. Loudoun County is expected to experience the fastest income gains this year of any county in the US. Not surprisingly, home values are holding up and actually gaining there. Government workers make much more than equivalent private workers and have far superior benefits. And to think, government produces nothing. Even in order to employ someone, government has to get the money for payroll from producing citizens of the country. And somehow, government feels it has to live better than the individuals from which it confiscates money. In so doing, government becomes arrogant enough to interfere with capitalism and play favorites by enriching banks. The resulting inflation is enough to make a person pick up a rock and..., well - we can live vicariously through the Egyptians who are now rising up in protest of the status quo. To investors, we must know one thing. Ignorance is the primary weapon of mass destruction that the central banks use. Ben Bernanke was asked last week if the Fed felt responsible for driving up food costs in Egypt. He responded to the negative and went on to say that food in Egypt was priced in Egyptian pounds. I guess his inference that he was destroying the US dollar and not the Egyptian pound was supposed to satisfy the idiots we laughing now refer to as the ‘media’. The truth is commodities throughout the world are priced in US dollars and what all central banks do is inflate. But we are not supposed to know this. In the meantime, the Egyptian central bank announced that they would stand behind all Egyptian bank deposits. With what - a printing press? Yeah, all central banks are alike. Central to investors, we must be concerned with the Holy Grail of finance - the credit default swaps on the sovereign debt. Egypt has about $40 billion in debt primarily to French and UK banks. God knows how much in default swaps are tied to this debt. Egad - bankers again stand to lose tens of billions! If the protestors do anything to put a premium on the Egyptian swaps, thus imperiling the banker profits, I suppose the bankers would have the army come in and mow the protestors down by the thousands. What? You wanted the truth, right? Anyway, I suspect the situation in Egypt will be resolved soon and the market will take it as a reason to rally. Sure, people might still starve and they might have no future but the central bank will ensure that bank profits are secure. Hallelujah! Aren’t we all happy? There will be more profits for Wall Streeters and us! The chart for this week is a chart that goes back to the beginning of September, 2010. This is the beginning of QE2 and for investment purposes, the beginning of the most recent stock rally. 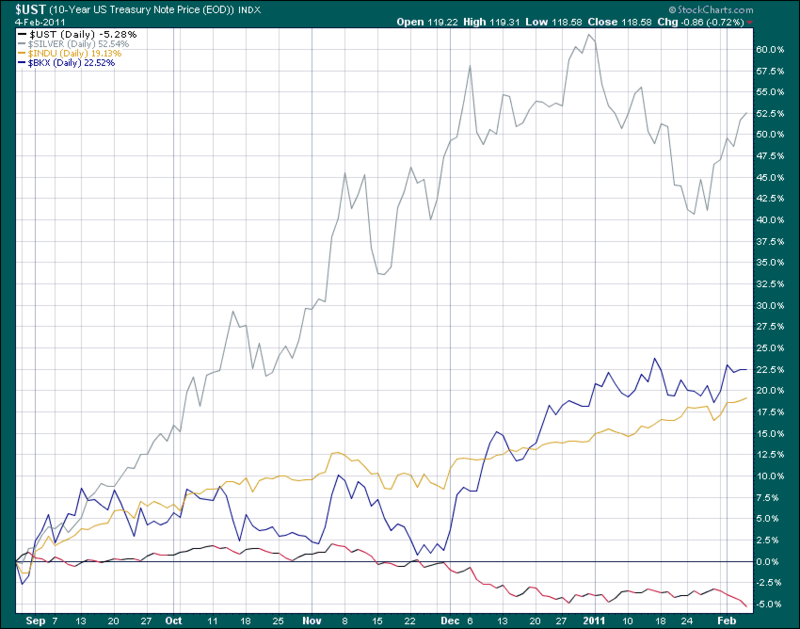 The silver line is silver, the gold line is the Dow, the blue line is the BKX banking ETF, and the red line is the 10-year US Treasury price. I thought it would be interesting to see our central bank policy in action. 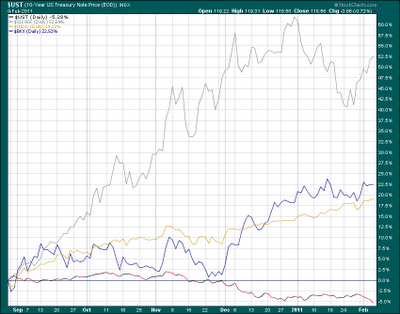 The Fed is buying Treasuries and they have lost some 5% since the beginning of our time frame. Some people would argue that the Fed might go broke if Treasuries keep selling off but I must ask, ‘with what are they buying Treasuries with?’ The answer is nothing. In actuality, the Fed is buying Treasuries with promises to print more money if pressed for a full accounting but that would be inflationary! That’s why they use ‘credits’ and that’s why the Fed can’t go bust. You and I, the taxpayers, are actually paying for QE2! You and I will pay for any losses. Anyway, silver is up about 50% since the Fed started this madness and that reflects investor trepidation about currency devaluation. But, the real object of the Fed’s action is the Dow Jones Industrial Average. We can see the punch that QE2 gave the Dow. Even more importantly, we can see that the banking ETF has actually outperformed the Dow in this time frame. So you see? Sure there is stomach crushing inflation rampant in the world. Sure the nation of Egypt and some of her neighbors are in the street of protest. Sure our collective futures have been stolen and mortgaged. But the important thing is the banks have been rewarded and enriched for their bumbling incompetence and governments have become even more emboldened with their power through the weapon of mendacity. Look at the chart to see the ultimate strategy of the central bank. Look at the chart and understand that the stock rally has a long way to go and no one is going to stop the central banks. Like the US, Egypt does not have Andrew Jackson among its living. Enjoy the rally. It comes at the expense of countries like Egypt. Take a bow, Mr. Bernanke!